Sudan’s President Omer al-Bashir relieved his foreign minister Ibrahim Ghandour said the official Sudan News Agency (SUNA) on Thursday evening. In a very short wire, SUNA reported that al-Bashir issued a presidential decree removing Ghandour from his position. Also, the decision was announced in less than three hours after the return of the president from Saudi Arabia where he participated in the 29th Arab League summit. Observers in Khartoum believe that the decision comes after Ghandour statements on Wednesday before the lawmakers where he said certain circles have delayed the salaries of Sudanese diplomats since seven months. “The president (al-Bashir) talked with the Governor of the Bank of Sudan several times, in the same way, the First Vice President, and the Minister of the Presidency follows the matter on a daily basis, but it seems that there are those who feel that the salaries of diplomats, staff, and mission rents are not a priority,” he told the parliament on Wednesday. The statements triggered a massive outpouring of reactions some supported him saying and praised him for his courage others said he had not to disclose such important information. Ghandour reportedly had already filed his resignation to President al-Bashir several months ago to protest the appointment of the former oil minister Awad al-Jaz as presidential aide tasked with relations with countries that have important investments in Sudan like China and Turkey. Ghandour handled very important files and negotiated the lift of U.S. economic sanctions with Sudan. Recently he built strong relations with Egyptian officials and successfully managed to reduce tensions between the two countries. The foreign minister of Sudan has revealed that his country is unable to pay many of its diplomats abroad while some diplomatic missions across the world could be closed over rent problems. Ibrahim Ghandour said Wednesday that several Sudanese foreign diplomats were seeking to return home as a result of the government’s inability to pay them for months. “Some ambassadors and diplomats want to return to Khartoum now… because of the difficulties faced by them and their families,” Ghandour said in a speech to lawmakers. The top diplomat said his ministry was also unable to pay the rent for several diplomatic missions across the world. 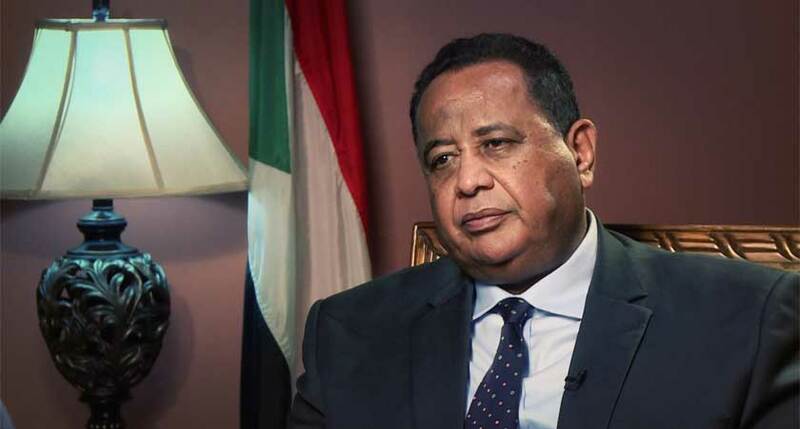 “For months Sudanese diplomats have not received salaries and there is also a delay in paying rent for diplomatic missions,” Ghandour said, without specifying which missions were affected. The minister accused some government officials of neglecting the diplomatic missions, saying they had a feeling that paying wages to diplomats and rent for diplomatic missions were not a priority. “The situation has now turned dangerous, which is why I am talking about it publicly,” said Ghandour. Elaborating on the details of the issue, Ghandour told reporters after the speech that his ministry’s total annual budget was about $69 million while the wages of diplomats and rents of missions amounted to about $30 million. Sudan has been hit by widening economic problems over the past years, especially since South Sudan separated from the north in 2011, taking with it about 75 percent of oil earnings. The country has tried to rely on foreign aids, especially those coming from rich Arab countries of the Persian Gulf region. The Sudanese military has even contributed to an ongoing military operation in Yemen led by Saudi Arabia, an apparent sign it is seeking increased funds from Riyadh to shore up its finances back at home. Taking sides with the Saudis and the Western governments in certain regional conflicts also convinced the administration of US President Donald Trump to lift its decades-old sanctions imposed on Khartoum, a move that sparked high expectations of a quick economic revival. However, those hopes were dashed as officials say international banks are still reluctant to do business with Sudanese counterparts, leaving the African country with a grim economic outlook.